The active GLP1 kit is designed for the accurate quantitative measurement of the glucagon-like peptide-1 active forms on cell supernatants. Active GLP-1, also known as glucagon-like peptide-1 active forms (GLP-1(7-36)NH2, and GLP-1(7-37)), has become a key biomarker in treatment of type 2 diabetes. The main actions of GLP-1 are stimulation of insulin secretion, and inhibition of glucagon secretion and food intake. In vivo, the active forms are rapidly degraded into inactive forms (9-36)NH2 and (9-37) by the dipeptidyl peptidase IV (DPP-IV). 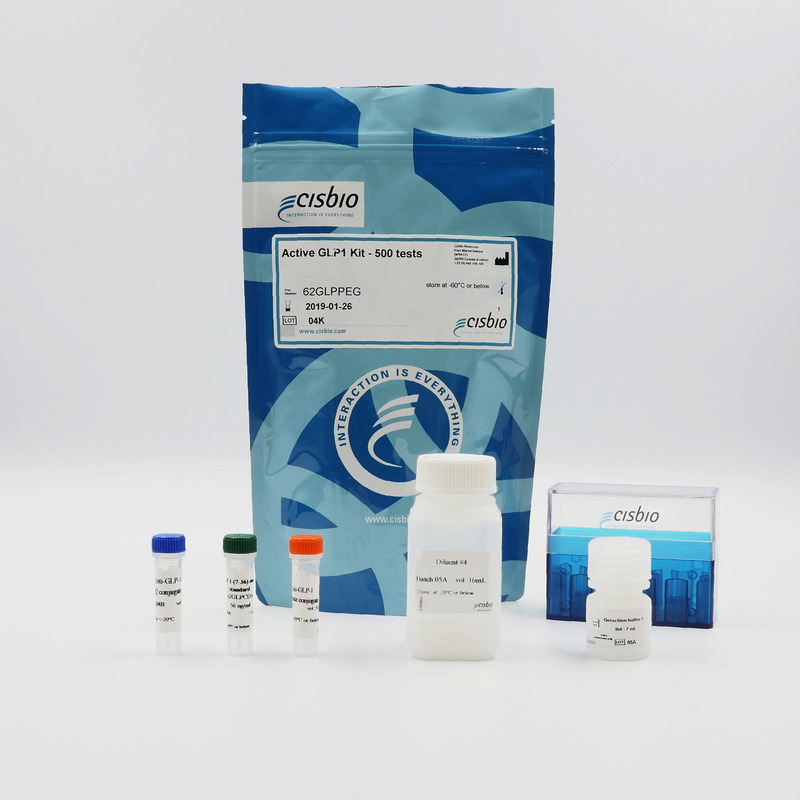 The active GLP-1 kit is designed for a rapid detection of GLP-1 in cell supernatants. Active GLP-1 is measured using a sandwich immunoassay involving two antibodies, one labelled with Lumi4Tb-Cryptate (Donor) and the second with d2 (Acceptor). The intensity of the signal is proportional to the concentration of GLP-1 active forms present in the sample. The active GLP-1 test can be run on cell supernatants using a simple 'addition and read' procedure described on the right (no wash steps). The HTRF conjugates may be pre-mixed and added in a single dispensing step to further streamline the protocol. An assay can be run in 96- to 384-well plates by simply resizing each addition volume proportionally. The active GLP-1 assay protocol is described here, using a white 384-well small volume plate. Active GLP-1 standard curve was performed in a final 20µL assay volume and read on a Pherastar instrument (BMG LABTECH). ​* Caution: all HTRF compatible readers but SpectraMax M5e and FlexStation reach this sensitivity criteria. As shown below, the active GLP-1 assay correlates well with classical ELISA assay while offering handling easiness and labor time saving. Side-by-side comparison of HTRF and ELISA assays for GLP-1 quantification was run in white 384-w small volume plate using crude NCI-H176 cell supernatants. A correlation factor of 0.97 was obtained (n=6). Dilutions of the NCI-H716 cell supernatants 1 and 2 were performed using the HTRF assay diluent. GLP-1 concentration was then determined in crude supernatants and in diluted samples (1:2, 1:4, 1:8 and 1:16). Figure on the right indicates the means (+/- SD) of 3 independent experiments. The strong correlations obtained between measured and expected GLP-1 concentrations demonstrate the linearity of dilution within the assay range. A time-course was determined for active GLP-1 secretion in human enteroendocrine NCI-H716 cells after glucose stimulation. Cells (2.105 cells/well) were seeded into 96-well culture plates pre-coated with Matrigel, and cultured for two days with DMEM 10% FBS medium. On the experiment day, cells were washed and incubated for 2 hours with increasing concentration of glucose in 100 µL of KRB supplemented with DPP IV inhibitor . At the end of glucose stimulation, 10 µL of supernatants were transferred to a 384 small volume-well plate, and assayed for active GLP-1 level as described in 'Assay protocol'. As expected, active GLP-1 was induced with Glucose dose dependence. The maximum amplitude of active GLP-1 triggered by 10% glucose versus basal production was 2.1.